Assessment of the potential for ocular irritation and toxicity of ophthalmic solutions represents an extremely important step in the development of both over-the-counter (OTC) and prescriptive pharmaceuticals. Excellent reviews of procedures describing these evaluations have been published (70-73). Refinements in procedures, study design, use of objective measures, and standardization of noninvasive methods such as specular microscopy have resulted in greater reliability, detection, and predictability. In addition, the incorporation of structure-activity relationship (SAR) evaluations provides an early assessment of probable toxic effects of the chemical moieties under consideration. The historical evaluation of these procedures can be traced through the literature (74-83), as can an understanding of the mechanisms of ocular response to external materials based on examination of the conjunctiva (84-87), the cornea (75,88-90), or the iris (49,75,91). Advances in design and use of ophthalmic drugs and devices have brought ocular toxicity into sharper focus. Many interior structures of the eye adjacent to target tissues, or which are targets of newer therapies themselves, can suffer irreversible damage, so safety evaluations must be comprehensive. In general, also, consideration must be given to the use of various ophthalmic preparations with other drugs and devices. Testing, therefore, must be based on risk analysis to include both the intended uses of the product as well as reasonably foreseeable misuse. Albino rabbits have been the primary species used to test ocular toxicity and irritation of ophthalmic formulations. While recent debate has centered on the use of rabbits or other species as predictors for human responses, there is consensus that there is no more reliable model that captures the full complexity of the eye and the ocular response of its intricate biochemical and physiological processes. In addition, the rabbit has obvious advantages due to its availability, ease of handling and maintenance, and large prominent unpigmented eye that facilitates observation of ocular structures (71). Compared with the human eye, rabbits exhibit differences in the tear layer (decreased tearing and blinking rate, presence of lipid from the species-specific Harderian gland), adnexa (loosely attached eyelids and presence of a nictitating membrane (86,92-94), cornea (i.e., structure of Bowman's membrane, slower corneal re-epithelialization (75), and endothelium (regenerative). The corneal differences result in increased ocular response to irritants in the rabbit. The primate has gained in popularity as an ocular model for the evaluation of drugs and chemicals because it is more similar to human eye (92,93). However, due to the difficulty and risk inherent in their care and handling, primates are used secondarily and in cases where other species may not provide an accurate assessment. This is especially true for drugs with melanin-binding characteristics that may accumulate in a pigmented iris, although species such as pigmented rabbits and minipigs provide some alternatives. Various governmental agencies have published guidelines for ocular irritancy studies (93-95). These guidelines are directed toward ophthalmic formulations, chemicals, cosmetics, extractables from ophthalmic containers, and other materials that may intentionally or accidentally contact the eye during use. It is the manufacturer's responsibility to determine those studies specifically appropriate for testing the safety of the ophthalmic formulation, yet abiding by governmental requirements and guidelines regarding ophthalmic preparations and excipients as well as biocompatibility of the packaging. As a part of the Federal Hazardous Substances Act (FHSA), a modified Draize test was adopted (96-98) as the official method for evaluation of acute ocular irritancy (99). It is a pass/fail determination that remains in effect today. The test may use a small volume more consistent with the capacity of the inferior conjunctival sac (100), and incorporate biomicroscopic slit-lamp examination and/or fluorescein staining to assess ocular changes (71,97,98). While various in vitro tests have been proposed to replace this in vivo evaluation and a U.S. interagency committee has recommended certain in vitro tests to detect severe irritants and corrosives, none has yet been officially accepted or validated (101-104). Current U.S. and international guidelines for toxicity evaluation of ophthalmic formulations involve both single and multiple applications to the eye, dependent on the proposed clinical use (71). The multiple applications may extend up to a 12-month period and incorporate evaluations of ocular irritation and toxicity, systemic toxicity, and determination of systemic exposure (toxicokinetics). In many cases, systemic exposure from the ocular route is less than by parenteral administration, information that will assist in determining the studies needed to establish safety of the ophthalmic preparation. 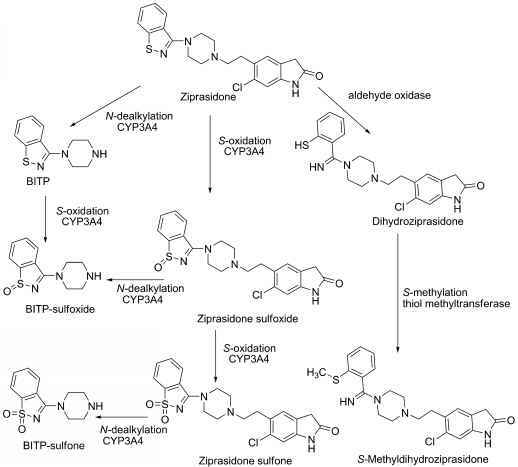 Evaluations must assess the drug substance itself as well as the drug product, since excipients and preservatives may significantly influence the length of exposure and tissue absorption and directly affect toxicity. U.S. and international guidance documents are available (105,106), and regulations and tests have been summarized for ophthalmic preparations (71,107,108). As mentioned previously (and discussed in detail in section "Contact Lens Care Products"), contact lens products have specific guidelines that focus on compatibility with the contact lens and biocompatibility with the cornea and conjunctiva (109). These solutions are viewed as new medical devices and require testing with the contact lenses with which they are to be used. Tests include a 21-day ocular study in rabbits, and may include other solutions that might be used with the lens. Additional tests to evaluate cytotoxicity, acute toxicity, sensitization potential (allergenicity), and risks specific to the preparation are also required (99,109,110). These tests are sufficient to meet requirements in the majority of countries, though testing requirements for Japan are currently much more extensive. While systemic exposure is rarely encountered in intraocularly administered drug products, there are safety concerns related to the biocompatibility of these products with ocular tissues. These products have special design and evaluation concerns, since they may have prolonged contact with essential and delicate tissues, such as the endothelium and trabecular meshwork (111). For such drug products, it is mandatory to design specific testing that mimics the proposed clinical exposure. Methods may include ex vivo models that perfuse the anterior chamber of excised rabbit eyes with the product and assess compatibility with the corneal endothelium using specular microscopy (112) and histopathology. These materials can also be evaluated against specific cell lines in tissue culture, particularly corneal endothelial tissue. As tissue culture technology progresses, cell lines for the other ocular tissues are being established and will become useful in compatibility testing as well. The sensitivity of the intraocular tissues places certain restrictions on intraocular dosage forms. In general, preparations that incorporate fewer ingredients in a properly balanced solution will have less likelihood of tissue incompatibility. This is not to say that a simple solution of drug in water is optimal, as even a simple isotonic solution of sodium chloride may be toxic to human corneal epithelial, endothelial, iris, and conjunctival cells. 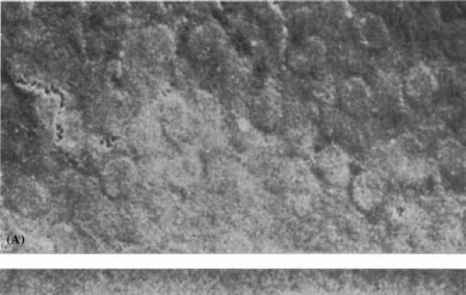 In the electron photomicrographs of human corneal endothelium presented in Figures 4 to 6, the effect of solution composition on tissue integrity is illustrated. Human corneal endothelial tissue perfused for three hours with lactated Ringer's solution shows cell darkening and swelling (Fig. 4), while normal cell confluence is retained in the same tissue perfused for three hours with Ringer's solution containing glutathione, adenosine, and bicarbonate (Fig. 5). A three-hour perfusion with a solution devoid of ingredients essential for normal cell confluence results in marked discontinuity of cell structure (Fig. 6). Some agents commonly used in topical ocular drugs can be used only sparingly or not at all for intraocular use, and pH and buffering capacity must be taken into account. Most preservative agents commonly used in topical ophthalmic preparations are not compatible with the tissues of the anterior segments of the eye (113). The USP recognizes this problem and specifically warns against their use in intraocular solutions (2,114). Drug stabilizers, such as antioxidants and chelating agents, must be used with care and should be used in absolutely minimal quantities only when necessary. Occasionally, it may seem desirable to solubilize an otherwise sparingly soluble ingredient. Only fairly low concentrations of typical cosolvents such as glycerin and propylene glycol can be employed because of their osmotic effect on the surrounding tissues. Hyperosmotic solutions may elicit some transient desiccation of the anterior chamber tissues whereas hypotonic solutions may cause edema that could lead to corneal clouding. There appears to be little or no experience with these or other common cosolvents in products of this type, and their use in solubilizing solution ingredients should be avoided. Figure 4 Human corneal endothelium following three-hour perfusion with lactated Ringer's solution: (A) scanning electron micrograph (2100x), (B) transmission electron micrograph (9100x). Source: Courtesy of H. Edelhauser. humor if a relatively small volume of the solution is introduced. Often, however, aqueous humor is lost in the procedure or the volume of solution is relatively large; therefore, drug products should be formulated as closely as possible to this physiological pH range, although the use of buffering agents should be avoided if possible. 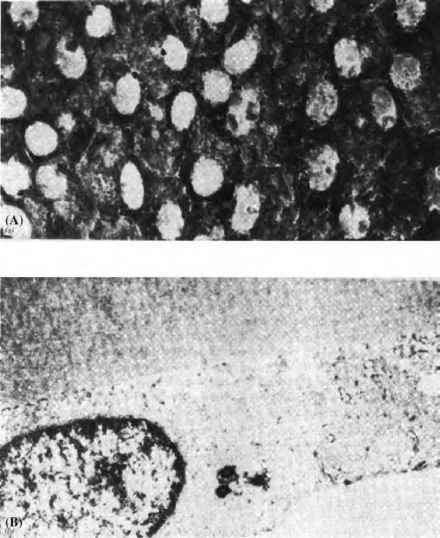 Figure 5 Human corneal endothelium following three-hour perfusion with glutathione bicarbonated Ringer's solution: (A) scanning electron micrograph (1950x), (B) transmission electron micrograph (8450x). Source: Courtesy of H. Edelhauser. in IOP and the onset of an acute attack of glaucoma. The formulator should be aware that particulates may originate from raw materials as well as glass fragments produced in glass ampoule fracture or elastomeric particles generated during stopper penetration. Very specialized stopper design, cleaning procedures, and lubrication should be considered when the latter type of packaging is used. 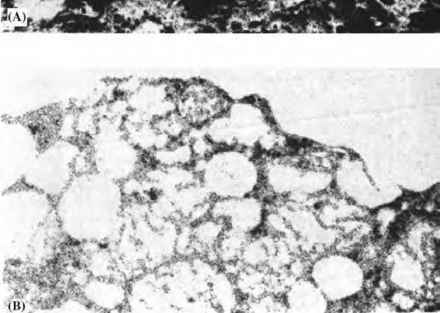 Figure 6 Human corneal endothelium following three-hour perfusion with solution devoid of essential nutrients: (A) scanning electron micrograph (2100x), (B) transmission electron micrograph (9100x). Source: Courtesy of H. Edelhauser. in the new blood vessels followed by laser treatment to destroy the vessels. Such new therapies and new routes of administration require special care in their design and evaluation. During the application of the various guidelines for ophthalmic, contact lens and intraocular products, ocular examination and biomicroscopic examination of rabbit eyes are completed with objective reproducible grading for conjunctival congestion, conjunctival swelling, conjunctival discharge, aqueous (humor) flare, iris involvement, corneal cloudiness, pannus, and fluorescein staining (71,115). Other available methods measure IOP, corneal thickness, endothelial cell changes, cells in the aqueous humor, and posterior segment changes. As part of improved design and responsible uses of animal models, in vivo methods that incorporate new noninvasive technology, such as confocal microscopy, and reduced numbers of animals have also been developed. Since international regulations specify the minimum number of animals that must be used, the latter are most useful in early development of these products. As alternatives to in vivo testing of ophthalmic preparations, numerous in vitro methods have been developed over the past few years as alternatives to in vivo ocular testing (73,116-124). Particular attention has been given recently to evaluation of preservative effects on corneal penetration (125,126), cytotoxicity (127-131), and effects on wound healing (132-134). These methods have been able so far to mimic only acute ocular dosing regimens, and validation efforts have not substantiated the correlation of any in vitro method with rabbit or human responses. However, these methods are useful for comparing relative toxicity under controlled conditions or preliminary evaluations prior to lengthy in vivo testing, and several manufacturers currently are using in vitro toxicity tests at early stages in the development of ophthalmic solutions.